Honor Your Process: Know When to Write and When Not to! Saturday Barry and I spent a luxurious two hours eating breakfast…unheard of for us! We drank two pots of tea, sitting and chatting, and finally we decided it was time to get on with our day. A wonderful benefit to me of Barry becoming a Spalding MFA in Writing student is that he has writing deadlines. Which, of course, encourages me to write when he is writing. Better yet, I have discovered a writing method called “Quick Write” that I will write a post about later. We have been indulging in them, and we had promised ourselves one this weekend. But. But, when Barry asked if I was ready to write on Saturday, I said no. Yes, his face looks just the way yours does if you know how much I love to write. We were both afraid we were coming down with colds, and I just didn’t feel well all the way around. Writing was not appealing just then. Also, the night before we had begun watching a documentary on Vermeer. Those of you who know that one of my life’s goals is to see all of Vermeer’s work will not be surprised that I really wanted to finish watching the documentary that I had fallen asleep trying to watch the night before. 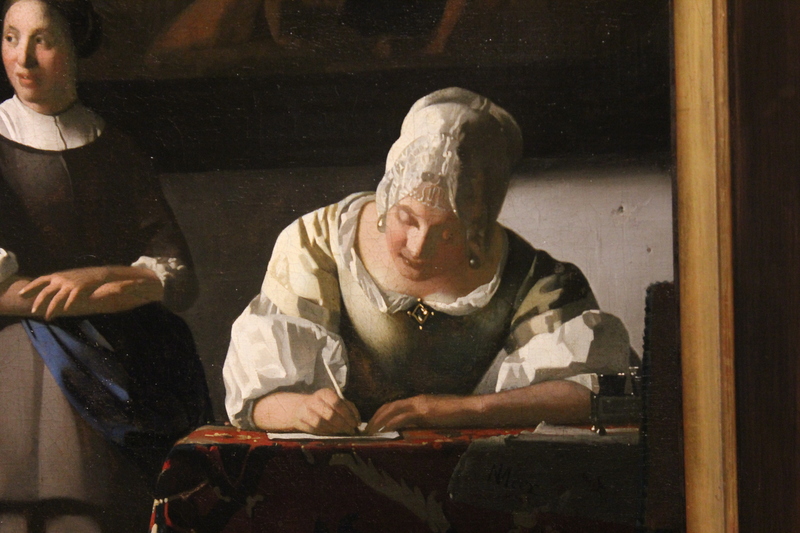 Watching the Vermeer segment meant we rolled into the next one (hence the prolonged hair marinating), which featured the work not of the artist I am writing my novel about, but that of one of his influences. We were only a few minutes in when my eyes widened. Though I had known of the connection between the painters, it wasn’t until I saw the highlighted painting that I realized my painter HAD to have seen that painting. In fact, I have been writing extensively about a painting that I now know I haven’t been seeing correctly at all because I didn’t know this new-to-me painting. NOW I was ready, to write, or so I thought. While Barry did a Spalding assignment to free himself for a Quick Write, I wrote a brief outline of what the painting meant to me, what it meant to the artist’s work, and how I could prove it, if I could. I should have been ready to write at that point, right? Except I wasn’t. This is where you have to dig down and ask yourself if you really shouldn’t be writing, or if you should press on. When Barry set the timer I put my fingers to the keys and tried to write. About five minutes in I was fiddling with my phone, trying to pull up a photo of the painting. “Research,” I mumbled while he valiantly wrote on. I wrote one scene, and then I felt as if I had finished what I had to say. I consulted my outline. I wrote a bit more. It was an effort. But finally, I realized that even though I wasn’t feeling it, what I was writing was important. It expressed some things about the artist that I hadn’t been able to articulate in the over two years I have been writing this novel. I still wrote slowly, leisurely, compared to my usually feverish style. The result wasn’t brilliant; it wasn’t polished, but when Barry called “Time,” I wasn’t totally embarrassed. Honoring my process, allowing myself NOT to write when I didn’t want to, and yet pressing through when I really felt I should, opened a new door in my novel. I can’t wait to see where this goes. As I always say, creative writing is not widget making. There are not definite steps to take to get out what you want to say. Please, honor your process. Whatever it is. Care to share what your creative process is? I’d love to hear about it! All “Write” Already! Be Professional. Writers, a word, please. You know I love you, right? But I think we are being a bit too precious. I’m including myself here. Especially me! The truth is, whether we write for a living or for fun, we make time for what is important to us. Sure, your life may be overwhelming at the moment, but if writing is in your blood, even if you can only squeeze in fifteen minutes a day to write, you’ll do it. Only you can really say what you can sacrifice to gain that time. What I really want to focus on is WHAT WE DO WITH OUR WRITING TIME! Many people have already written about how often writers procrastinate. We do so for many reasons — fear, anticipation, laziness, distraction. A. I’m too busy to cook. B. I’m too tired to cook. C. I just can’t get into it. D. I don’t think I can do it. Making an omelet is too hard. I think I’ll go back to being a _____. E. No one appreciates good cooking anyway. It’s all just product to the owner. He doesn’t care about my creativity. F. But I got a text and there’s this party. G. Wait! I’m just going to watch ten minutes of this show first. You get the idea? What would you do if you didn’t get your omelet? What would you think of that chef? Yeah, me too. If we’re going to write, let’s be professional about it, please. You set aside writing time, and even if it’s total crap, you write. So what if you write in the wrong direction or if you hate it when you’re finished? Throw the omelet out and start over, or see if you can turn it into a frittata. While writing CAN be a magical, mystical process (just yesterday I put in something as a placeholder until I could research it, and inexplicably my placeholder was exactly right, even though I KNOW I’ve never read that fact before), but it doesn’t have to be. Sometimes it’s just grunt work and you just break those eggs, whip them, and put them in the pan. Because you can. Now, if you’re REALLY feeling it, you can get fancy and add spices, fry up some veggies, and even grate some fancy cheese. We forget sometimes that we GET to write. It’s a privilege. Yes, it can torment us. It can haunt us and cause us to take long midnight walks to try to outrun the writing hound, but we also kinda hype all that, don’t you think? We writers tend to be a dramatic lot. So what I am saying is, even if writing isn’t your 9 to 5, treat it as if it is. The Muse will respect you for it, and more importantly, you may discover you don’t need a stinking muse. Everything you need is in you, literally. Now just commit to getting it out, you pro, you! You have my permission to print this and keep it by your desk, highlighting it freely. I know that’s what I’m going to do with it, because I sure could have used this earlier today before I gritted my teeth and just went for it. I’m happy to say I edited almost 20 pages in this manner.